Access to clean, healthy air is something all Minnesotan’s deserve. More than half of air pollution comes from things we drive or power equipment we use. Highest levels of air pollution reach you while in your car driving down a busy highway or street. Bumper-to-bumper or not, the density of vehicles creates a tunnel of unhealthy air that you can’t avoid breathing. Compared to other states around the country, Minnesota ranks high in overall air quality. Even on good air quality days, you can limit exposure to air pollutants by minimizing the time you spend near busy roadways, idling vehicles, construction equipment, and burning activities such as recreational fires. Poor air quality can affect lung and heart health. Consider especially those in certain at-risk groups including children, people with heart or lung issues and those who exercise or work vigorously outside. For instance, this time of year, vehicle exhaust is a powerful asthma trigger. An asthmatic child in my neighborhood is so affected by the fumes that her parents encourage all neighbors to limit time spent warming up their cars on bitter cold days. Nevertheless, even people who are otherwise healthy may experience health effects when pollution increases. 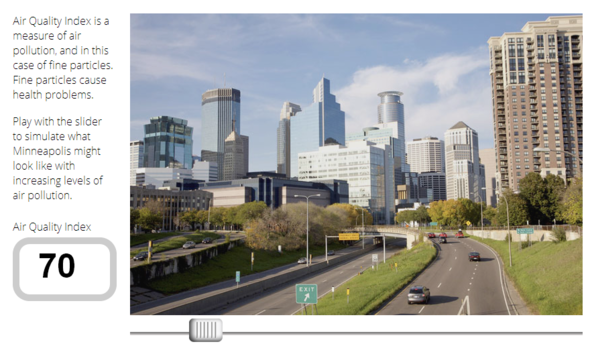 Some Minnesotan cities, including Minneapolis, are taking action to reduce unnecessary vehicle idling and passing anti-idling ordinances—resulting in cleaner air for everyone. The Air Quality Index, or AQI, is a measure of air pollution created by the U.S. Environmental Protection Agency to provide a uniform way to report daily air conditions. Like a measuring stick, it helps us understand how clean our air is and how it is changing over time. Like a weather forecast, you can use AQI results and air quality forecasts to reduce your exposure to unhealthy levels of air pollution. The Minnesota Air App, available for iPhone, Android and Windows, and the MPCA’s AQI website provide daily AQI forecasts and real-time air quality conditions to help you plan your activities and protect your health. Air quality conditions are updated hourly for cities across Minnesota. Daily air quality forecasts are available for the Twin Cities and Rochester. You can also get air quality alerts and forecasts through email, Twitter or even get texts sent to your phone. What does bad air look like? In the winter, certain weather conditions can create high levels of fine particle pollution. Fine particles come from diesel, gasoline, industry, wood burning and chemical reactions in the air. While individual fine particles are not visible to the naked eye, high levels of fine particle pollution can reduce visibility. MPCA’s live haze camera feeds give an indication of air clarity, which is affected by fine particle pollution. Air pollution that causes haze can come from man-made sources, such as factories and cars, or natural sources like dust, wildfires, and volcanoes. Play with the slider below to simulate what Minneapolis might look like with increasing levels of fine particle air pollution. In the past year, Minneapolis- St. Paul had 5 days with a fine particle or ozone AQI value over 100, including one day above 150. 218 days were in the Good category with AQIs 0-50. Take a look at other cities across the US. More data is available at www.epa.gov/airdata. 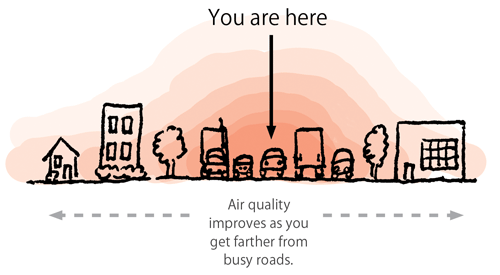 What are 5 things you can do to make air healthier for all Minnesotans? Choose a cleaner commute. Drive your car less—Carpool. Bike. Bus. Telecommute. Be creative. Burn only dry, untreated wood. No garbage. No painted or varnished wood. Especially, don’t burn during air quality alerts. Use less energy. Insulate your house well. Turn off electrical stuff you’re not using. It all adds up. Turn off your engine. An idling engine creates a hot spot of pollution. Buses and big trucks particularly produce unhealthy exhaust. Attend Hennepin County’s upcoming Mend-It Clinic and get help restoring clothing and other soft goods from volunteers with sewing skills. Bring items such as clothes, bags, linens or curtains. Volunteers can fix broken hems/seams, buttons, belt loops, rips, zippers, stuffed toys and much more in order to save those goods from being dumped in the trash. January 25, noon-3 p.m., Northeast Library (Minneapolis). Join the Minnesota Zoo and their next Our World Speaker Series—Attracting Birds, Butterflies and Other Backyard Wildlife. Bring nature to your backyard by learning how to create wildlife-friendly gardens and restore the ecological health of your neighborhood. January 22, 7:00-9:00 p.m. (Apple Valley). It may be cold, but you can still enjoy the outdoors in the middle of winter. Learn how to snowshoe at Maplewood’s Winter Open House. Sleds will be available for pulling young kids. January 18, 10:00 a.m.-3:00 p.m., Maplewood Nature Center (Maplewood). Back to Basics: “Hope For The Future” will be promoting sustainable living through workshops, speakers, activities and more. Topics include eco-friendly tips such as energy awareness and greener living. February 1, 8 a.m.-4:30 p.m., Pine River-Backus High School (Pine River). Attention youth in grades 4-12! The Will Steger Foundation and Minnesota Pollution Control Agency are sponsoring the Youth Voices of Change: Climate Change Video Competition. To participate, just create a video that shows how you are engaging in solutions to climate change in your home, school or community. Videos are due by May 16, 2014. Ten finalist videos will be chosen and the competition winners will be announced the evening of August 22, 2014 on the Sustainability Stage at the Eco Experience at the State Fair.